BRISTOL, Tenn. – Ben Kennedy’s mom is arguably the most powerful female in motorsports. But that fact likely went unnoticed to many race fans when the 21-year-old showed up at Bristol Motor Speedway earlier today to make his NASCAR Camping World Truck Series debut. Lesa France Kennedy, a member of NASCAR’s board of directors, will be keeping a watchful eye on her son as he wheels his No. 96 Chevrolet around the .533-mile, high-banked oval in tonight’s UNOH 200. “My family is definitely there behind me to support me and everything,” said Kennedy, whose great-grandfather is Bill France Sr. “(Having the last name) Kennedy does help a lite bit. It helps disguise it. 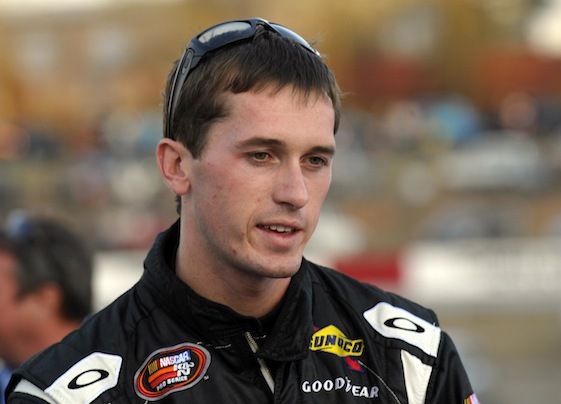 Kennedy plans on competing in upcoming truck races at Iowa Speedway, Chicagoland Speedway and Homestead-Miami Speedway. “As far as 2014, nothing is set in stone yet. It’s up in the air. We’d love to run in trucks or Nationwide or something,” he said. Kennedy qualified 19th for Wednesday night’s race and finished 20th. After racing everything from Late Models to NASCAR’s Truck Series, second-generation driver Chase Elliott learned last week that longtime sponsor Aaron’s won’t return as his primary sponsor in 2014. The Atlanta-based rent-to-own company will instead pour its motorsports marketing dollars into the No. 55 Toyota to be driven full-time by Brian Vickers next year. “We knew at some point it was going to come down to them having to make a decision,” said the 17-year-old Elliott, son of 1988 Sprint Cup champion Bill Elliott. “Unfortunately, it wasn’t with us. I’m just proud to say we’ve had a great relationship with the past number of years that I’ve been racing. They got me to the position that I’m at right now. “I’m not a guy that likes to burn any bridges with them, or anybody for that matter. If our paths cross in the future, I’m definitely not going to turn that down. NASCAR’s Sprint Cup and Nationwide Series will roll into Atlanta Motor Speedway on Labor Day weekend while its truck series heads north of the border. The truck competitors will have the opportunity to turn left-and-right in just over a week when they battle for 130 laps around the Canadian Tire Motorsport Park in Bowmanville, Ontario. “I went up there a couple weeks ago and drove a Canadian Tire Series car for the full day and I was very, very thankful that I went up there and did that because that place is going to be tough,” veteran driver Matt Crafton said. “I’m just telling you that.